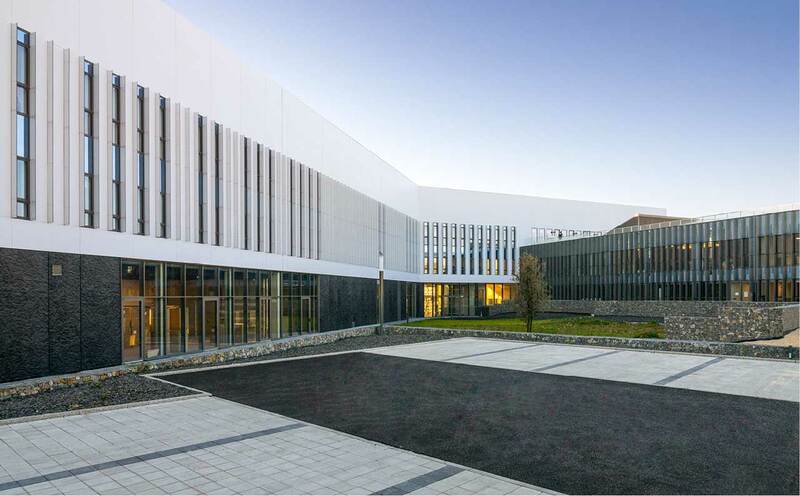 The Roullier Group, operating for over 50 years, specialising in plant and animal nutrition, with over 7,000 employees in 46 countries, has created its new global research and development centre in the French port city of Saint-Malo. This emblematic building project was created by renowned architect Jean Pierre Meignan, who trusted PORCELANOSA Group to create the exterior facade and interior of this spectacular construction. The facade is made of 2,500m2 of KRION®, installed with the K-FIX construction system from Butech, a firm of the PORCELANOSA Group. The works carried out with KRION® have included the curtain wall which gives the building one of its main, recognisable lines of expression, marking its character. Additionally, the canopy at the entrance of the global research centre is also made from KRION® Light Grey 6902. Its location just 20 metres from the Atlantic Ocean led the studio of Jean Pierre Meignan to use a material which offers durability over time, and against the elements such as the potassium nitrate which is present near the sea, using KRION® as an ideal solution.